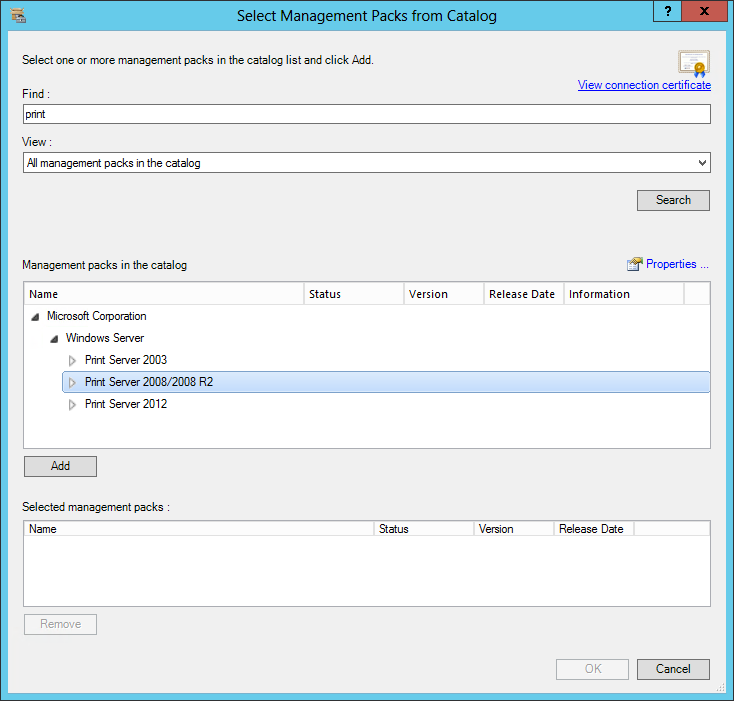 Microsoft System Center Suite: Print Server Management Pack - Finally Updated! 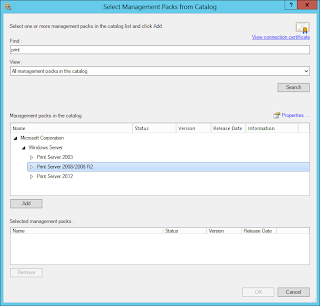 Microsoft released the other day an update for the Print Server management pack, finally! 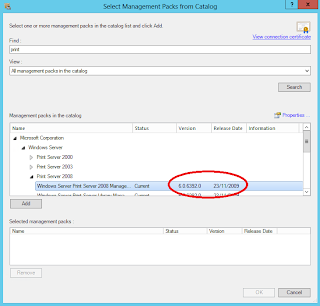 I've moaned about Microsoft's attitude towards this management pack for some time. 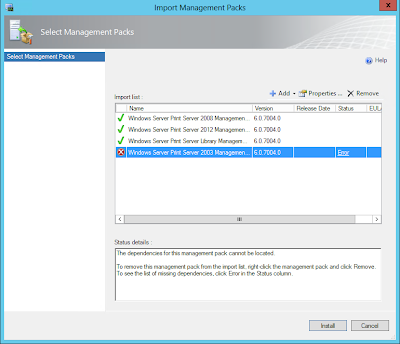 But back to the here and now... MS have an updated MP available for Microsoft Print Servers. 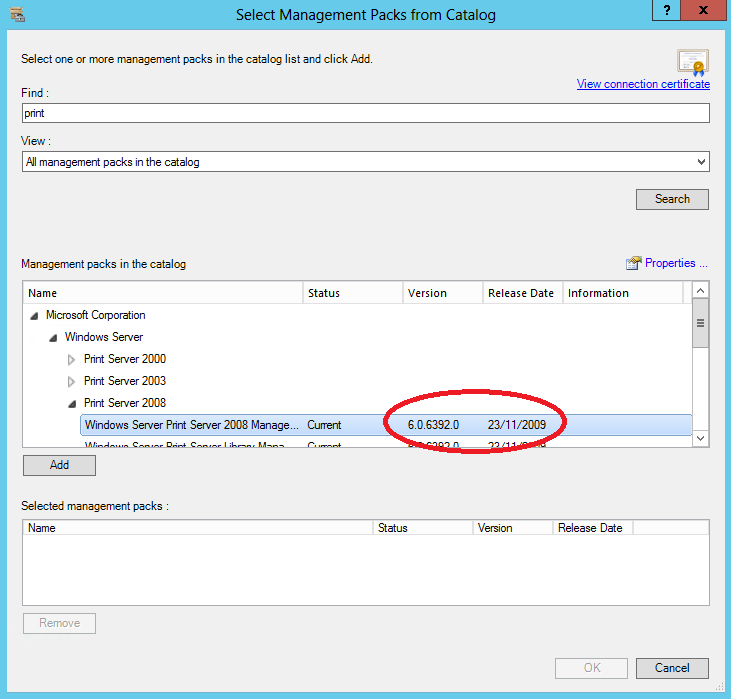 From the MP Documentation it appears that not only is Server 2012 now supported, but finally 2008 R2 is as well. Going through the Import MP Wizard and searching the catalogue will at present not get you access to the new Print MP as it doesn't yet seem to be updated. That's not always a bad thing however as I would always recommend downloading the MP manually otherwise you may miss the associated MP Guide document. 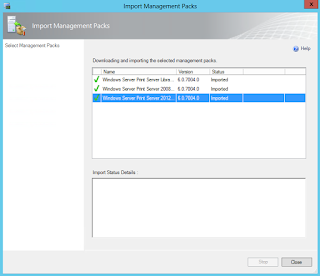 As always with SCOM MP's, RTFM first before import!! Surprisingly, this MP is only listed as an Operations Manager 2007 R2 MP. This is slightly strange with them adding Print Server monitoring on Server 2012 since monitoring Server 2012 with SCOM 2007 R2 isn't supported natively, well not without running 2012 Agents reporting back to your 2007 R2 Management Servers. 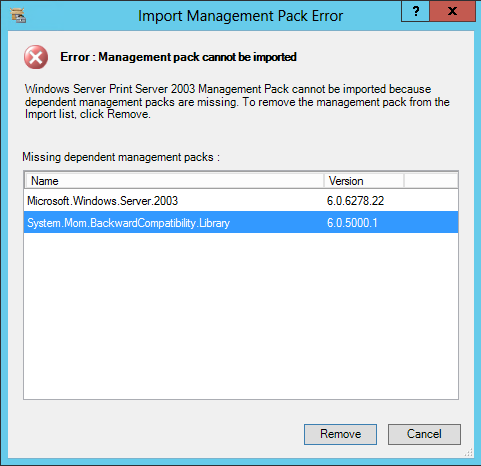 I've downloaded it anyway to test with SCOM 2012 and on first try of importing, I'm presented with an error that a dependant MP for the Print Server 2003 MP is missing. Import works fine on SCOM 2012. Notice there's no reference to 2008 R2? 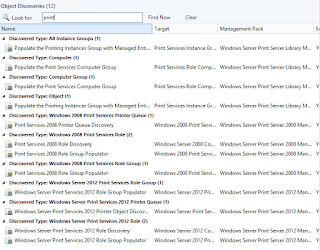 SELECT Name FROM Win32_ServerFeature WHERE Name = "Print Services"
SELECT Name FROM Win32_ServerFeature WHERE Name = "Print Services" OR Name = "Print and Document Services"
Easy little change and simpler than listing specific names as it covers both 2008 & 2008 R2 regardless of the specific name. The same WMI query is also used in the 2012 MP which should mean if any name changes are made in an R2 release of 2012 the MP should carry on working. I was going to run a difference compare against the old and the new MP, but I seem to have misplaced my old copy of the MP. As soon as I can get my hands on one I'll run one and update the post. I'll also retract my previous comment (below) as it was rather harsh and actually untrue. Now that I've done more that skim the MP guide, it does contain numerous references to 2008 R2 /facepalm. As mentioned by Daniel Savage in the comments, the MP Guide includes all rules etc stored within the MP for reference. 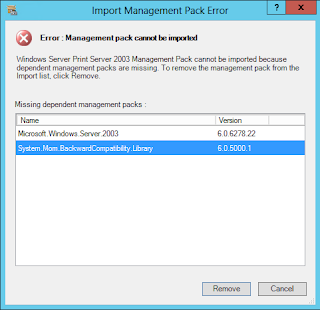 In short, it appears at first glance to run ok on SCOM 2012, but requires more testing. 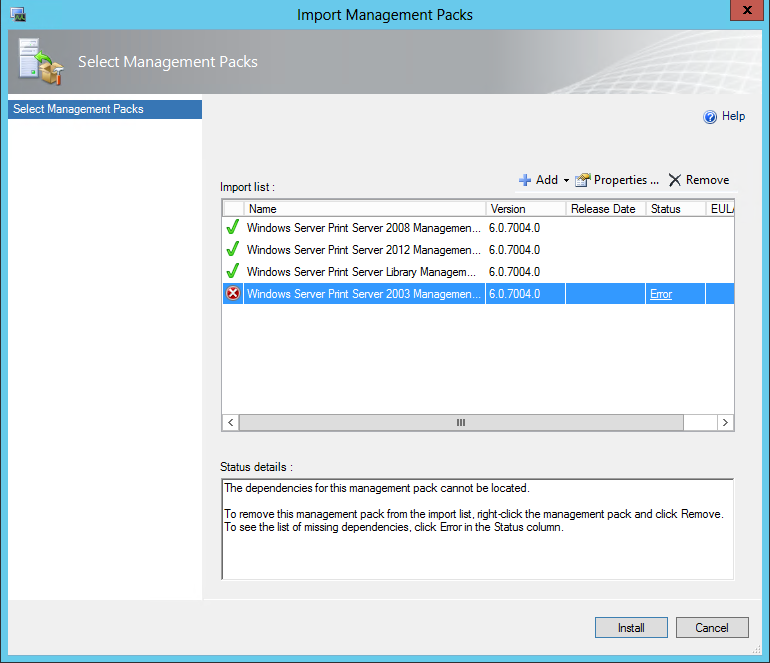 I think it's probably just laziness on Microsoft's part that they couldn't be bothered to re-write the MP guide completely and just chose to add references to Server 2012 only rather than go back and add 2008 R2, which to be honest wouldn't add much value as it's 99.9% the same monitoring as plain 2008. 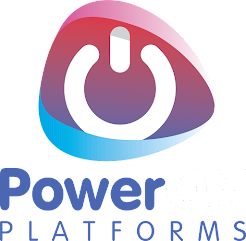 Print Server MPs are now in the Product Catalog. Note this MP has been completely re-worked for 2008/2008R2 and 2012 and the guide does contain details of all the rules and monitors it enables. No problem. Thanks for getting the message out there! Yes the MP was updated, but unfortunately does not appear to support clustered print servers. 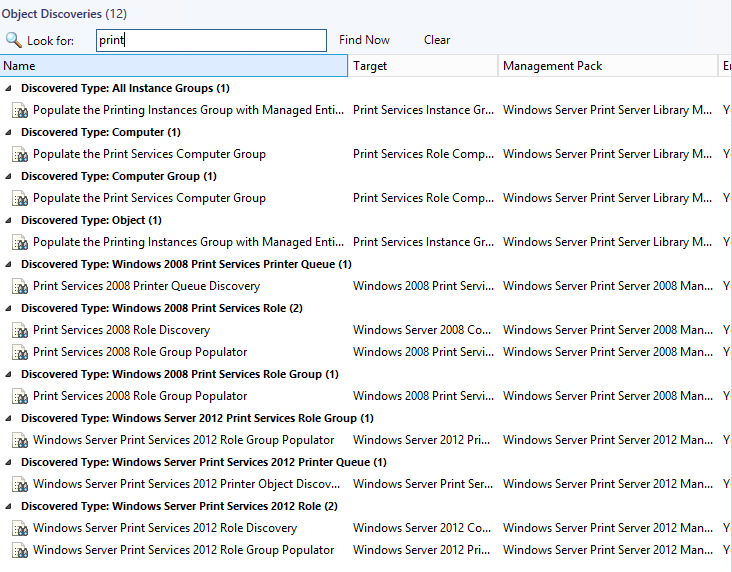 The 'Print Services 2008 Printer Queue Discovery' is using .InstancesOf("Win32_Printer") in the WMI call and that will only find OS printer Q's, not clustered version of same.